A friend asked me what drew me to live in Tasmania on and off for the past thirty years. I sketched an outline of the island on a blank page in my notebook. “It’s a heart,” I said. “It could be a bum,” she replied. I went to Tasmania the first time when I was twenty-three. I was a newly minted nurse from South Australia, and with my country town background, midwifery was considered a good thing to do. I’d applied to two states to do the course. The small maternity hospital in the northern city of Devonport, population twenty thousand, contacted me first. Three days later, I heard from Sydney, but by then my fate was sealed. The day after I arrived there, I was walking down a quiet country road, the shape of the island surrounded by blue in my mind. I felt like if I jumped hard enough I’d be able to make it bob up and down. Early on, friends from Adelaide came over for a holiday and we headed to Cradle Mountain to do a walk around Dove Lake. We were the only people there. Rugged up in coats and scarves, we followed the signs to the Ballroom Forest. The physical world I’d known until then was the small valley I grew up in, the often dusty plains around it, and the city of Adelaide. In my geography class at school, we’d studied rainforests and I’d carefully copied an illustration of the different levels of trees and undergrowth into my exercise book. Being in it – the cold air on my cheeks, the sound of ice crunching under my feet as I walked along a shallow creek bed, the moment when we walked into the rainforest and the old school sketch in my mind was replaced by the real thing – woke something up in me. Trees I’d never seen before, their leaves heavy with moisture, bent over us as we walked through the glade. Ferns and bracken covered the ground, and the air smelled of moist soil and leafy debris. We wandered off the track and ran our fingers over the moss-covered exposed roots of an old tree. Drawn by the sound of pebbles rolling over each other in the bend of a stream, I made a cup with my hands and scooped up some bracken-stained water, so cold that my eyes watered as I gulped it down. After that day, I went into the mountains often, with German medical students and Canadian physiotherapists, with other mainlanders – it didn’t take long to stop calling other parts of Australia “interstate” – and, occasionally, with locals. I’d do long day walks and come home exhausted. After a hot bath and a bowl of soup, I’d sleep deeply until morning. All the while, the Franklin River dam debate was raging towards its eventual High Court resolution. Peter Dombrovskis’ image of morning mist over the river had travelled around the world, along with photos of bulldozers, and police manhandling protesters. Robin Gray had become premier and told the prime minister that Tasmania would secede if the Commonwealth interfered in the state’s affairs. Bob Brown had been arrested, jailed, and then elected to the Tasmanian parliament on the day of his release. In those first few months in Tasmania, I’d learnt to be careful about expressing a view. There were undercurrents at work and outsiders’ ideas weren’t welcome. This was local business and I was just a fly-by-nighter, like many of the other health workers. In my class of ten, eight of us were from the mainland. Not long after the dam was halted forever, in July 1983, two friends and I drove over to Strahan, a few hours away. We must have looked like protesters. The locals scowled at us as we wandered along the wharf. We did the Gordon River cruise, had a meal at the pub, then set up a tent on Ocean Beach, eating Tim Tam biscuits dipped in port to warm us up. In direct line of a westerly, the wind whipped the tent all night, while the sea crashed to shore just a few hundred metres away. Dressed in every bit of clothing I had, wrapped in my sleeping bag, I hardly slept, but didn’t care. When the first light touched the tent, I crawled out on to the beach with the others. We sat taking in big breaths of the salty air, as the sky turned watery blue and the grey sea chopped its way towards us. It was wild. 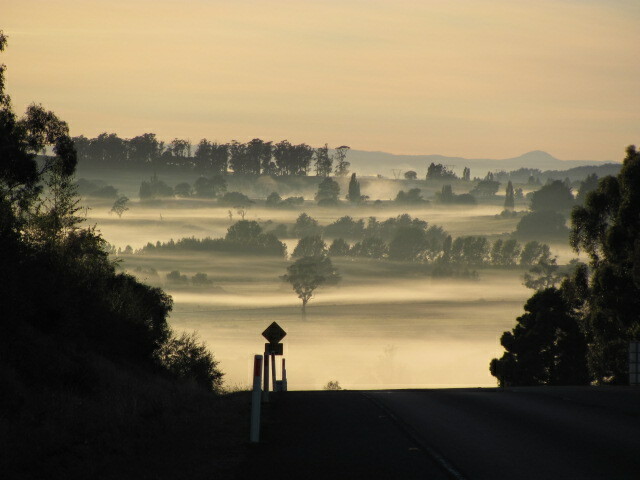 At the end of that first year I left Tasmania and went to the other side of the world to live for a while. Five years later, I made my way back, drawn by my memories of the beauty, and a job in a government service in the capital. I hadn’t twigged how small the population really was until soon after I arrived, when I met up with an old mainland friend who was about to leave. I asked him how many people lived in Hobart. “178,236,” he said. “I counted them.” Recently, it topped two hundred thousand, in a total population of just over half a million, scattered over a geographic area not quite the size of Ireland. I often used to go to meetings in Launceston, two and a quarter hours north of Hobart. If you’re Tasmanian, you tend to have no idea of distances measured in kilometres. From Hobart it’s four or five hours to Burnie. The west coast, five or six hours depending on whether there’s snow on the road. The east coast, well, depends how far up you’re going. There’s only one highway – the Midlands – where you can really get a speed up. It’s all curves in Tasmania and it’s rare to have an uninterrupted view of the sea. There’s always a bay curling round, or an outcrop of rocks, or a mountain. Your view of the world bends inward. You don’t have that sense of big blue horizons like you get in other parts of Australia. The possibilities seem different. In Campbell Town, halfway between Hobart and Launceston, there was a cafe where everyone would stop for a coffee. I’d meet fellow public servants there, all doing the run up north and grumbling about how come they – the northerners – don’t have to travel south. Mainlanders who moved to Hobart thought it was mad. Hobart was the capital. Why didn’t people go there for meetings? The answer lay in the past and the landscape. Both cities began around the same time, in the early 1800s. Hobart was set up from London as the administrative centre for the penal colony, while Launceston was an outpost of the young Sydney settlement, and aligned itself more with the mainland. Apparently many people in Launceston today still think it should have been the capital. For a long time, I didn’t know the history of the tensions of the two cities, but I’d sense it often at work. A few years into my time there, one night as I watched the weather at the end of the news, I knew I’d finally become a little bit Tasmanian. On hearing that Hobart would be 24 and sunny, and Launceston 17 and overcast, I did a whoop of victory. Sometimes, I wondered what I was doing there. After London with its music and theatre and the arts, it was strange to be back in a small place. Occasionally I went to the Doghouse, a pub with alternative music, mostly bands doing their first gig, then announcing at the end that they were off to the mainland. All through the ‘90s, things were tight. Michael Field, elected premier in 1989, had found a big budget deficit and set about fixing it. Meanwhile, I was moving around the public service, picking up different jobs – developing policy, running community consultations, teaching management skills, designing system improvements. Specialist skills are thin on the ground in Tasmania, which means you can get jobs without having a lot of experience, jobs you probably would have to compete a lot harder for on the mainland. While this can be great for the experience you build up, it also means it can be difficult to get a measure of how skilled you are. In the years of policy work, I became good at mining Australian Bureau of Statistics data for signs of disaster and despair. It gets sad after a while, constantly telling the story in official documents about how disadvantaged Tasmania is compared to most of Australia – high rates of poverty, unemployment, chronic disease; low rates of literacy and school retention. In the mid ‘90s, so many people were leaving the state that it clicked over into population decline. Like Sisyphus, you keep pushing that stone up the mountain. People work hard to make a difference, but when there are only a few of you pushing, or when everyone is pushing in different directions, it’s easy to lose energy. The stone rolls back down. By the late ‘90s, all the signs were that it was lying on the bottom of the ocean. There was round after round of public service cuts, where anything with “development” in the job title seemed to be a target. I was due some long service leave and decided to take it. The first few months back in South Australia were strange. Walking along Adelaide streets, I’d stop and turn around, and squint into the distance. Then my eyes would drop, and a thin wisp of something I couldn’t name would float away. One day I realised what I was looking for – Mount Wellington. In Hobart, it’s a constant reference point for your place in the world. It’s how you get your bearings. Although not everyone sees it that way. A few years before, at a dinner party hosted by a work colleague and her husband, we’d had a common Tasmanian conversation. To stay or go? They’d lived in London for a few years. Their stories echoed the mainlander lament: what if I’m missing out on something brilliant over there? Meanwhile, I was in one of my starry-eyed stages about Hobart. I stayed away nearly two years. In the second year, I felt something tugging at me. I almost expected to see a fish-hook caught in my navel, the rod back in Tasmania. I was being reeled in. As the ship sailed into Devonport at daybreak, I remember standing on the deck gazing at Mount Roland, the granite rock flickering pink in the dawn light, and thinking to myself, “Bugger. It’s still really beautiful”. I knew I was going to get caught again. There was another lure too. Jim Bacon was premier, and he was trying a couple of let’s-turn-this-ship-around moves. One was to create a shared vision for the future. Eventually known as Tasmania Together, it was a participatory democracy process based on one in the US state of Oregon. Tasmanians, at home and far-flung, were invited to imagine what they wanted the state to become. Some, like me, wrote submissions, others took part in big meetings of people representing cross-sections of the community. Out of it came a vision for Tasmania in 2020 and goals that covered all aspects of Tasmanian life, including ending old-growth logging. This one caused mayhem, and in 2003, spilled over into Bacon’s other big move, a two-yearly arts festival called Ten Days on the Island. The first festival kicked off in 2001. Robyn Archer was artistic director and staged shows all around the island. Bacon had anticipated the protests that would have followed if, like any other state, all the events had been held in the capital city. You don’t do that in Tasmania. The island’s population is dispersed. Half the people live in the south, half in the north. Around forty per cent live outside of the two main cities. Scanning the program, I’d see a play or music that looked good and circle it. Then I’d notice it was on in Launceston. Or Burnie. Or Strahan. Not Hobart. My shoulders slumped. I wanted a festival of arts, not a festival of driving. Sticking to Hobart, on a crisp clear autumn afternoon, I started with the Ten Days welcome ceremony on Aboriginal land at Risdon Cove, then headed to a free concert at Salamanca. At the Playhouse, I watched an Irish play based on a provincial rugby team who famously beat the All Blacks in 1978. At the Peacock Theatre, I saw two one-person plays, one about an elderly Fijian-New Zealand matriarch passing her mantle on to the next generation, another about a young Indian couple running a corner shop in New Zealand, torn between their old and new lives. I found them moving and let go of my fixation on the festival needing to be on the scale of those in big cities. It was the sort of powerful theatre you could do on a small, island-size budget. Bacon had also set up a regional book prize, at the time the most generous state writing prize in Australia, and I went along to the island-sized award ceremony one afternoon and listened to writers reading their work. While I’d been away, I’d started up my own business. I relocated it to Tasmania, re-established old friendships and work connections, and settled again. Until the second Ten Days on the Island festival, two years later. One of the main sponsors was Forestry Tasmania. Green groups called for a boycott. It got personal. A few weeks before the festival started, I was at a cafe with a friend. As we got up to go, she spotted a postcard about the boycott on the counter and pushed it towards me, with a look that was part-plea, part-challenge. More and more old-growth trees were being ripped up and many Tasmanians, me included, were coming to realise that and hated it. I was torn. The arts and the natural environment had both drawn me back. I was being told to take a position that would mean choosing one over the other. It seemed crazy. One of my friends was up for going to festival shows with me. Boycotting the boycott, we called it. This time, there was a writers’ weekend program to go with the book prize. Anna Funder talked about her book Stasiland, about the East German secret police and their insidious spread into everyday life. Iraqi writer Hadi Kazwini read his poems about civilisation, exile and grief. At the same time as a big anti-forestry protest was on in one of the parks, East Timorese poet and president Xanana Gusmao spoke about the importance of becoming reconciled with Indonesia post-independence. We saw a play about Timorese women and the violence they had suffered, and another one about a Palawa woman’s lifetime of constantly moving house. It upset me that these artists weren’t being seen by more people, my friends among them. I watched the fighting play out – protests at shows I went to, a young fellow painting an anti-festival slogan on the pavement outside the venue for the book prize ceremony. I went to the Republic Bar and Cafe one night to hear a bunch of speakers take it in turns to talk about the protest, taking different sides, or two, mostly. I was relieved when a guy from a local performing arts company got up and said, “Don’t make me choose. Don’t draw a line and make me say which side I have to stand on”. Honestly you forest people, you’re as bad as each other. Forestry Tasmania with your series of ads strategically embedded among the Ten Days on the Island reviews. The protesters giving instructions to boycott the festival or at least wear a green armband and be gloomy. Someone I knew through work rang me the morning it was published. “How’s your bum?” she asked. I’d not known that her partner worked for the forest industry. She was on that side. I spotted Robyn Archer at Salamanca on the last night of the festival. As I headed to a cabaret act in a little circus tent on the lawns, I wondered if she’d be back. I don’t want to live in a place where there are only two stories. I want many local stories told and heard well, and with enough power to lift me above my own limited view. Sometimes it happens. For the 2007 Ten Days festival, a couple of Tasmanian artists persuaded Hobart’s billboard advertisers to hand over their signs for two weeks. People from the margins – refugees, prisoners, homeless people – had been invited to say what home was to them. Twenty or so of the responses ended up on billboards, in bold white text on a post-box red background. On my way to work one morning, at the traffic lights, the first one caught my eye. place where you look for them. They were poetic and poignant. Making my way around town, they’d appear in the margins of my vision, drawing me into the private worlds of strangers who also inhabited this small city. This is the sort of thing you can do with art in Hobart. It only has about thirty billboards. By the mid-2000s, my business was going well and I was ready to do some more study. I’d been reading George Orwell’s essay, “Politics and the English Language”, then Don Watson’s Death Sentence, about public language and jargon. Much of my work was still for government departments, writing policies and plans. I couldn’t “unsee” what Orwell and Watson had put in front of me. I’d heard about a two-year writing and editing course in Melbourne. Hobart TAFE had tried to run a version of it for a few years, but it limped along as they struggled to find and keep good teachers. I tried one by distance education, but midway through it was discontinued. One Sunday morning, I sat up in bed with a cup of tea and stared out the window, trying to work out what to do. The thread that moored me to Tasmania broke. “I have to go to Melbourne,” I said out loud. I didn’t know how I’d do it, but I knew I had to. There was enough work in Tasmania to be able to return regularly, as well as work remotely from Melbourne. Now I’ve finished the course and I’ve been going to Tasmania more often and staying for longer periods. But I’ve also been making a life in Melbourne. And now I’m facing the question of whether to stay there or go back to Tasmania. Things became quiet on the work front in Hobart for a while last year. Old and trusted clients told me that they didn’t know whether they were going to have enough funding to keep their services going. “We’re holding off on non-essentials,” they said. In that environment, anything but crisis work and business as usual is non-essential. No money for development, for dreaming up a better future and helping people develop the skills to make a life for themselves within it. To make change last requires persistence. It’s an obvious cliché for Tasmania, but while you’re squabbling over the trees, you can’t see the bigger picture. The Tasmania Together process nearly made it to creating a shared vision of a future that people could feel part of, but the environment battles in the early years were a big distraction. It’s still going, although I don’t know how strongly. Maybe setting all those goals and targets does focus everyone’s efforts and maybe dreams can come true. Although the state’s vision for 2020 – “an island community, unique for its natural and cultural environment, where people enjoy a prosperous lifestyle based on quality, creativity and opportunity” – hasn’t quite set me on fire. It sounds contained – “an island community” – inward-looking, isolated. And all those meandering commas make it feel more like a stroll in a park than a determined and dedicated effort to make the world a better place. Sometimes, in my work, I write vision statements for clients and I’ve come up with a few dreary ones. They seem to happen when everyone is being careful not to really change anything. I hope everyone who wants to live in Tasmania can prosper in it. A bit of harmony would be good too. It was a smart move to finally set up the forest peace talks, even if they’ve faltered along the way. Sit the squabbling parties down, see what they need, collect the facts, have the fights in private. Meanwhile, the rest of the people can get on with the equally important jobs of teaching and caring and cultivating talent and creating meaningful work. A local warned me when I first went to Tasmania that it takes twenty years to be considered a Tasmanian. My total time there would add up to that now, but I still don’t feel like I’m one. I’m part of the place, but not part of it either. At heart, perhaps, I’m a mainlander. I talked about it with a friend. Do you think things are finally changing in Tassie, I asked her. Is it getting better? “Will there be enough to hold them for long?” I asked. An island can be a metaphor for limits, but there are always possibilities. In a way, it’s a small-scale version of the planet. How can we live well – all of us – in the limited space we have? For me, it makes sense to stay in Melbourne for now. The work is picking up again in Hobart, but it seems like it might always be precarious. The island tips this way and that, like a boat bobbing about in the ocean. A few weeks ago, I let myself entertain a thought I’ve not dared to before. What if I cut my ties with Tasmania completely? What if I didn’t ever return? Then I remembered what the guy at the Republic said on the night of the debate about the festival boycott, ten years ago. Don’t make me choose.